In the last two days, US President Trump has tweeted 15 times about professional (American) football players either dropping to one knee or linking arms during the playing of the US National Anthem before games. While the players (and in some cases, coaches and team owners) were expressing solidarity with those players (starting with Colin Kaepernick last year) who dropped to a knee to protest social injustice and police brutality, the President interpreted those actions differently, as expressing disrespect of the anthem and the US flag. The US professional football players’ action is quite different from the non-verbal behavior often associated with sports teams, which typically involves intimidating the opponents, rather than expressing social or political stances. A well-known example is the war dance of the New Zealand “All Blacks” rugby team, based on the indigenous Māori “Haka” tradition. The gesture of taking a knee is a dynamic and complex one, and one that many soldiers…do to show respect for their fallen fellows or to take a rest while on a mission. Catholics also traditionally take knees—or genuflect—before the altar, as did subjects before rulers in antiquity and the Middle Ages. Marriage-proposers also traditionally take knees when asking for their partner’s hand in marriage. Kneeling, here, is at once submissive and reverential, showing humility and adoration. The use of the expression to “take a knee” (now appearing in hashtagged form as either #TakeAKnee or #TakeTheKnee) is examined in a post yesterday on Language Log. The action of dropping to one’s knees unexpectedly can have a dramatic effect. 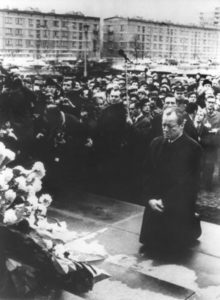 This was the case in Willy Brandt’s “Kniefall von Warchau” (the Warsaw genuflection) in 1970. As German Chancellor, he was on a visit to the Memorial to the Warsaw Ghetto Uprising (1943), when, after laying a wreath, he suddenly dropped to his knees in a gesture of humility and repentance for Nazi Germany’s atrocities. After 2003, each young officer was issued a set of 21 CD-ROMs for computer-based training — jokingly called “SWOS in a Box” — to take with them to sea and learn. Young officers were required to complete this instructor-less course in between earning their shipboard qualifications, management of their divisions and collateral duties. The article asserts that those navigating the ships which suffered the collisions were trained under this system and concludes that “the Navy’s growing reliance on technology has eroded basic seamanship skills”. A story on National Public Radio last week echoes this view, with the commentator describing the change in the approach to training in this way: “They’ve been given a load of CDs. That’s right – online learning”. The dismissive tone used here is something one hears often in connection with online learning, with the implication being that of course it cannot be as effective as face-to-face instruction. The problem here, as is often the case, is that this assessment does not consider the nature of the computer-based learning environment. It’s entirely possible to have such instruction be ineffective. Self-paced learning materials which center around static content presentation through presentations and documents are not likely to foster effective learning. But a slew of studies have shown that computer-based learning can be effective – if done right, with dynamic, media-rich, and interactive content. It’s particularly effective if incorporated into a socially connected and collaborative online learning environment. I have no idea how well the Navy’s training materials were designed, but neither did the commentators cited above. This kind of undifferentiated assessment of the use of technology in education and training gives a distorted picture of the reality of online learning.